Music label uses Facebook and Twitter to find and fund new artists | What Hi-Fi? A Belgian record label is using Facebook and Twitter to uncover new artists – and then find the fans willing to fund their releases. 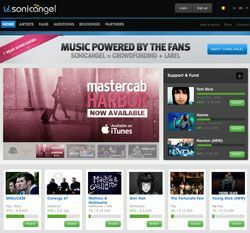 SonicAngel has enjoyed three number one hits in Belgium in the last year and is currently funding 20 new artists. The label scans social media platforms for the most talked-about artists before hand-picking a shortlist, which fans can then choose to fund. Bart Becks, who co-founded SonicAngel, told Reuters: ""If you look at how music is getting distributed nowadays, it's a lot of people talking about their favorite bands on Twitter and Facebook, so we turned the model around." "The most important difference with SonicAngel is that we choose the artists and don't allow every artist on the platform," said co-founder Maurice Engelen. The label also has a separate website where musicians can upload tracks for people to support. The company then tracks the buzz around each artist before giving people the chance to invest. People can buy a share in an artist or band for 10 euros each, with pay-outs promised as soon as they start to make money. SonicAngel is now working with the University of Ghent and the Massachusetts Institute of Technology on a new project which could scan the entire web for the top-trending bands.